Ethan Turner's Facebook profile picture. 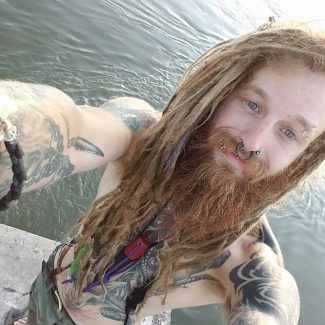 A late Monday night rollover accident on the Transfer Trail four-wheel-drive road north of Glenwood Springs claimed the life of local rafting guide, outdoor adventurer and performance artist Ethan Turner. According to the Colorado State Patrol, Turner, 25, who lived in Rifle, was by himself headed north on the backcountry access road about 2 miles north of Glenwood around 11:30 p.m. Monday when the wreck happened. State Patrol Trooper Gary Cutler said Wednesday morning that Turner was driving a 1998 black Toyota Forerunner when he drove off the left side of the road on a sharp curve and rolled the vehicle several times down the embankment. He was not wearing a seatbelt, and was ejected from the vehicle, Cutler said. “Excessive speed is suspected in the cause of the crash,” Cutler said, adding State Patrol was not alerted to the wreck until the following morning. Garfield County Sheriff’s deputies were the first on the scene, but it was not immediately clear if there was a period of time before the wreck was discovered, or if someone witnessed the incident and reported it. Turner was pronounced dead at the scene by Garfield County Coroner Robert Glassmire. According to Turner’s Facebook page profile, he was employed as a sales associate at the seasonal Spirit Halloween store in Glenwood Springs. He was also a raft guide and boathouse manager for Up the Creek Rafting. Turner was also studying outdoor education at Colorado Mountain College, and had previously studied at the Coney Island Sideshow School and performed as a sword swallower, according to his profile.